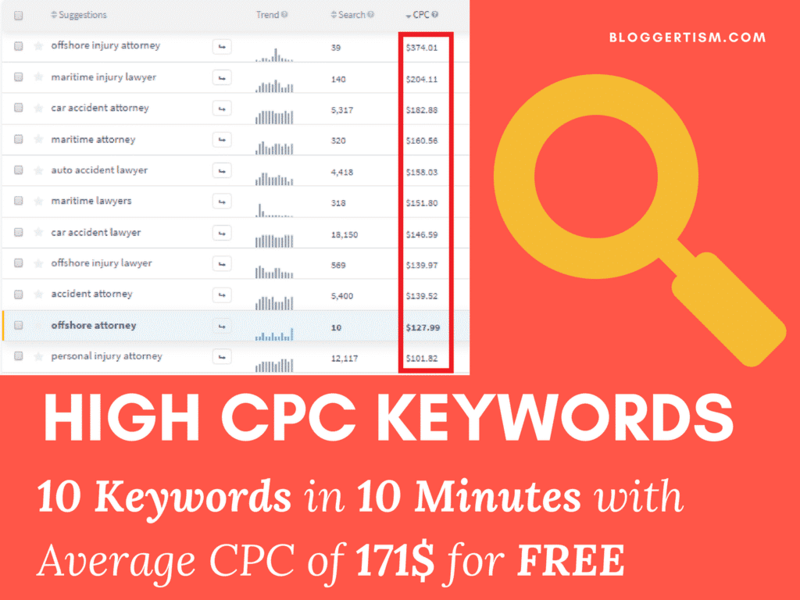 Hundreds of Bloggers published articles on how to find high CPC keywords. Revealing ways to find profitable high paying keywords but they forget the way I am going to tell you today. They shared ways using SEMRush and other paid tools. These tools are not just expensive but also complicated too. But I will share how to find high CPC keywords for free in 10 minutes. We will use a free tool that finds expired domains. Using that we will find domains containing high CPC keywords in their names. We will extract these keywords and BOOM We found them, the high CPC keywords. So without wasting time let us start!! In The above Image, we can See that CPCs are starting from 300+$ and that is a huge amount to get paid per click. Well, Now comes the main part of extracting keywords. Let us take first domain as an example. 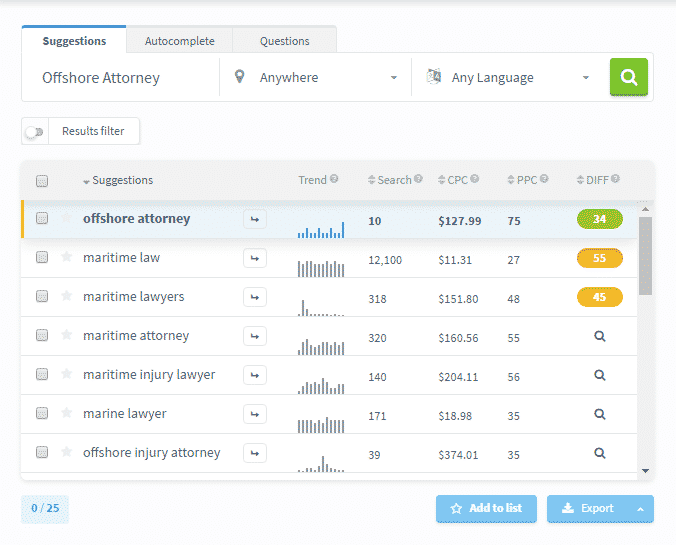 It is Offshore-Attorneys.com. Here the keyword will be Offshore Attorney. Now let us find its CPC. Simple go to KWFinder.com (Free up to a limit) and enter the keyword. Click on The CPC word Present above (See Screenshot Below) to arrange them in descending order. I am saying again it is just beginning. I have a bonus trick for you. Get it otherwise see conclusion for another gift. 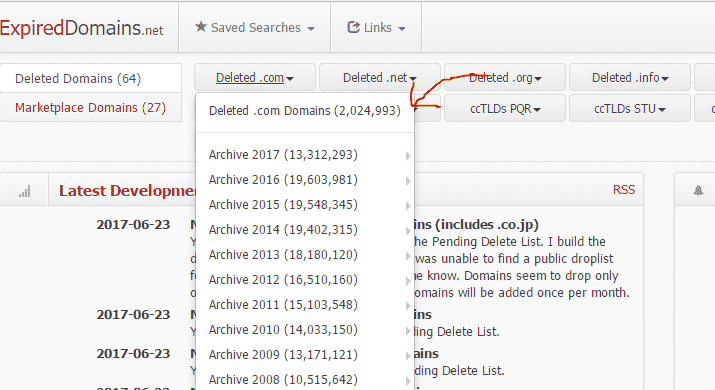 If you noticed them with SEO point of view then you may have not noticed that with these amazing keywords you are also getting expired domains with exact match name (EMD). EMD are easy to rank. So if you really want to bank some dollars then purchase that domain (do not forget to see its spam metrics). Rank on it and have a vacation on a beach. Put Your email and let me reveal the Secret Tip to Make Quick Cash from these keywords. At last, I would also like you to read this article of IftiSEO that explains AdSense CPC Guide and Explains the Real Concept here. A Person with an Idea to convert Newbies into Professionals is Ammar. Awesome tips to find high CPC keywords. I believe you have explained it in a simple manner. I would certainly share this post for people who are struggling to find profitable keywords. Wow! 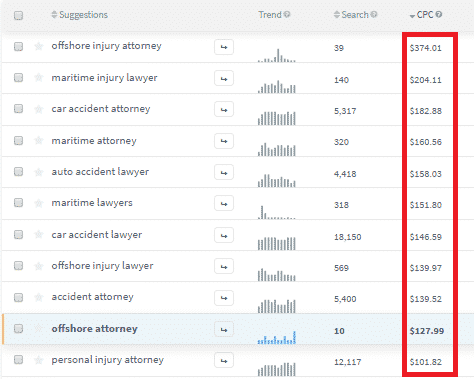 This is really amazing method to find the high CPC keywords and thanks for sharing the keywords mate. Looking forward for another similar kinda post. Ezoic Review: Never use it before Reading this Review! Bloggertism is a leading blog providing information about various topics of Blogging and earning online.